On a cold January day I spotted this American Magpie. It was on a snow covered tree stump foraging for food. 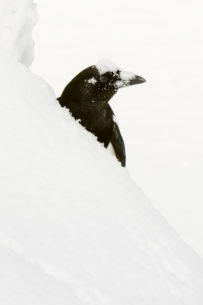 It would completely disappear in the snow and use its beak to fling the snow out of the way. It would pop up for a couple of seconds with its head covered in snow to observe its surroundings.